This luxury hotel in Los Angeles is where the stars go to get their rocks off in private (or in public, if they court the limelight). Built in 1920 using blueprints drawn from a French castle in the Loire Valley, Chateau Marmont has a history as spectacular as its architecture, and a reputation as hedonistic as it is glamorous. The arts and crafts ‘castle on the hill’ is the epitome of all that’s great and good about tinseltown: glamorous, cool and utterly captivating. For decades after its 1929 debut, the Sunset Tower Hotel was one of the starriest, most glamorous addresses in this starry, most glamorous of cities. And now it’s back, as classically elegant and discreetly seductive as ever. If all you do is wake up in your curved-wall suite, lounge by the Hollywood Hills-view pool all day, and then wander down to your table at the famed Tower Bar for dinner, you’ll have a perfect Los Angeles day. 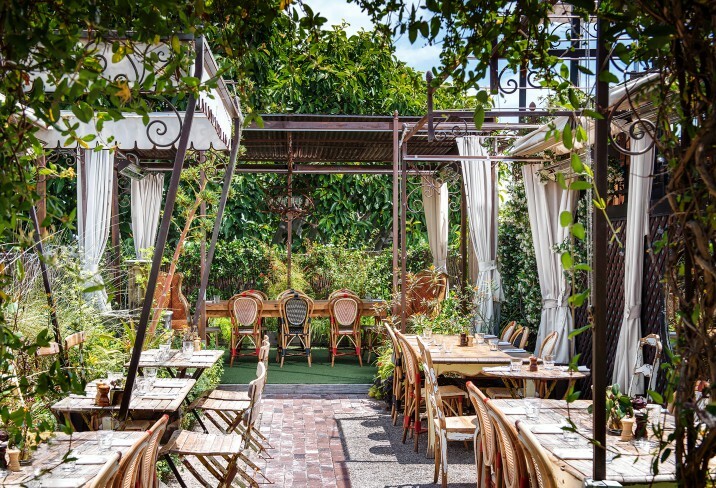 Start your weekend getaway with brunch at The Eveleigh, a leisurely eight-minute walk down Sunset Boulevard from the hotel. Feeling the alternative eating movement vibe? Head over to Gracias Madre and embrace California vegan food culture at this Mexican eatery. Or perhaps you’re having more carnivorous cravings, in which case you should hit up Animal. Runyon Canyon and its fabulous views Los Angeles (and rampant people-watching and celebrity spotting opportunities) is just north of the the Sunset Tower Hotel. Grab your trendiest ‘I’m so breezy, I do this all the time’ workout kit and a water bottle and hit the trail. Well worth it for the outdoorsy sense of accomplishment and that vantage point. In the evening try AOC Wine Bar and Restaurant. Share the small plates with your dinner companion and sample the extensive wine collection. Or head to innovative ink. restaurant sit at the prep bar to watch the chefs in action. West Hollywood is the perfect location for rooftop cocktails. Slip into your date night best and head to Palihouse West Hollywood's Sunset Cocktail Lounge, an open air bar with summer cocktails, small bites, and 360 views of the Hollywood Hills. For a mix of rooftop drinking meets secret garden, head to Pearl's Liquor Bar. Just off Santa Monica Boulevard, Petit Ermitage is an eccentric muddle of art, antiques, flora and fauna. The owners’ collection of artefacts and paintings are displayed throughout the hotel, adding gallery-like gravitas. One thing’s for sure: you won’t be bored here, whether dining in the Garden – the outdoor restaurant packed with vibrant blooms which also doubles as a butterfly and hummingbird sanctuary – watching the sunset from the deck by the flickering flames of the outdoor fireplace, or sipping a mojito by the rooftop pool. Give your wallet a workout on Melrose Avenue with stops at Fred Segal, Costume National and Agent Provocateur. In summer, catch a star-studded performances LA Philharmonic at the Hollywood Bowl at 2301 North Highland Avenue while dining on a picnic lunch prepared by Petit Ermitage’s chef. On the second Sunday of each month, head to one of the city’s best flea markets at the Rose Bowl at 1001 Rose Bowl Drive in Pasadena (+1 323 560 7469). Pick out vibrant blooms and fresh fruits and vegetables for a picnic at the Santa Monica Farmers’ Market every Sunday (+1 310 458 8712). Just 45 minutes from LAX airport, Avalon Hotel is a Beverly Hills boutique bolt-hole that sports retro-fabulous '50s furniture (think Charles Eames chairs, George Nelson lamps and tables by Isamu Noguchi), a vintage hourglass-shaped swimming pool, and a decidedly cool poolside restaurant and cocktail bar. 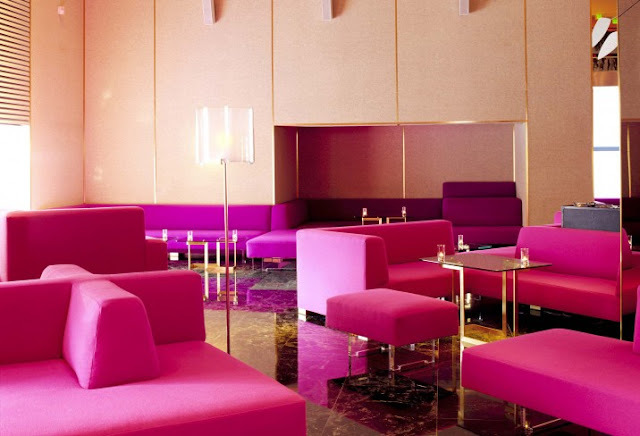 What do you get if you cross James Bond bachelor chic, mid-century metropolitan architecture and acid-bright pop-culture wit? 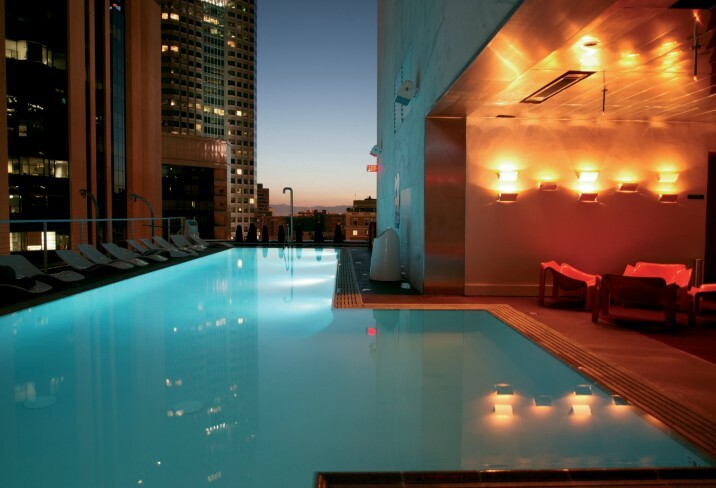 The Standard, Downtown LA. This fun and funky downtown boutique hotel in Los Angeles has one of the coolest bars in LA, baths big enough for basketball players, and on-the-money decor that cries out to be a Sixties-era film set. The Walt Disney Concert Hall on Grand Avenue in Downtown is home to the LA Philharmonic orchestra, but it’s worth a visit just to see Frank Gehry’s fantastic cubist architecture. If you like to do your shopping under one enormous roof, the Beverly Center mega-mall on Beverly Boulevard is a spendthrift's heaven.